Want better results on your landing pages? It may be as simple as selecting the right opening. A few years ago, copywriters Michael Masterson and John Forde began studying record-breaking sales letters to see if there was a hidden formula among them. What they discovered is that it all comes down to the first 100 to 600 words after the headline, better known as the lead. Think of it as your promotion’s pick-up line: a good one could be the start of a meaningful relationship. A bad one could drive readers away for good. The six openings Masterson and Forde discovered are so powerful, they consistently convert better and sell more. Which is why they’re now considered basic training in one of the top copyriting programs on the market: AWAI’s Accelerated Program for Six-Figure Copywriting. These leads can be used as landing page openings, video sales letter openings or any number of other channels where you are making an offer. The promise lead places your product front and center. There’s no warm up and no need for it. If you have a big, bold promise, build your whole promotion around it. Put it in the headline. Start your lead with it. Then close your offer with it too. This lead, from Prevention’s “Brainpower Game Plan” promotion, is a good example. 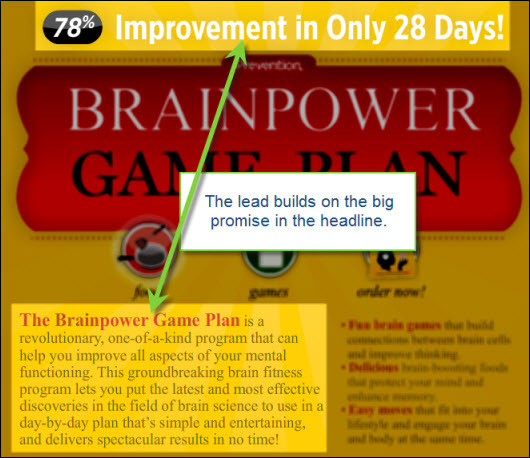 In this promotion, the promise is given in the headline: 78% better memory in only 28 days. This promise is so clear and compelling, it doesn’t need to be repeated. The lead simply builds on it. In addition, the promise is big enough to be worth the investment. Specifics sell, but only if they’re impressive. A 30% improvement might not be worth it, but 78% certainly is. The problem/solution lead pushes readers’ hot buttons to generate a strong emotional response. It opens with a problem that creates fear, worry or unhappiness, then introduces the product as a solution. A good problem/solution lead removes blame and offers an easy solution. 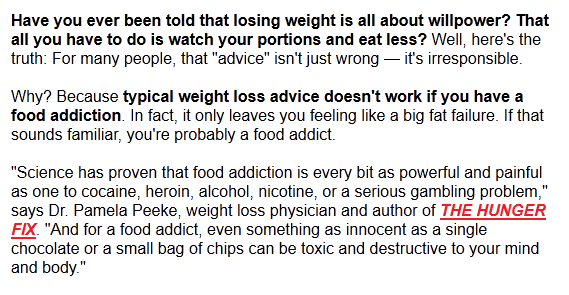 This one does it well, assuring readers that if they haven’t been able to lose weight, they may be the victim of a powerful addiction. That sets the stage for the solution, which is information on how to overcome addictive hunger. Always present your solution as the “savior.” Without it, the problem is overwhelming. With it, it’s easy. Notice how it’s done here. Phrases like “eliminate your addictive hunger,” “effortlessly lose those stubborn pounds,” and “conquer your cravings” promise to empower readers, so they can take back control and finally succeed. This type of lead gains traction by teasing readers with important information that will only be revealed if they buy the product. It works particularly well with a breakthrough discovery, unique system, or insider information. 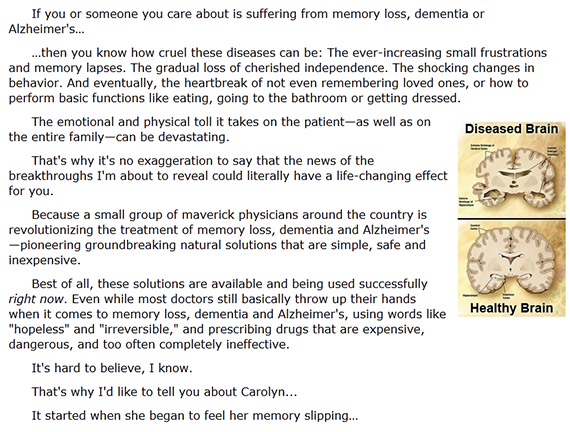 Let’s look at how Natural Health Insiders does it in the “How Carolyn Reversed her Alzheimer’s by Disobeying Her Doctor” promotion. Like the problem/solution lead, the secret lead will often focus on a problem. But rather than introducing the solution directly, it teases and hints without ever revealing it. The goal is to build enough curiosity that the reader can’t resist buying the product to finally get the answer. Notice that this lead begins by selecting the target audience and identifying its biggest fear. It then agitates the problem. Words like “breakthrough,” “life-changing,” “maverick physicians” and “revolutionizing the treatment” build credibility. Stories about real people prove that the secret works. Remember that secret leads need to be believable. Provide lots of proof that the secret is worth the investment: stories and testimonials, scientific and statistical evidence, and teasers about specific information you’ll get if you purchase. Stories are an indirect approach, but they’re one of the best ways to engage readers. Use a story lead whenever you have a strong testimonial or case study. Use it to explain how and why you created your product. Or use it to add credibility to big claims. 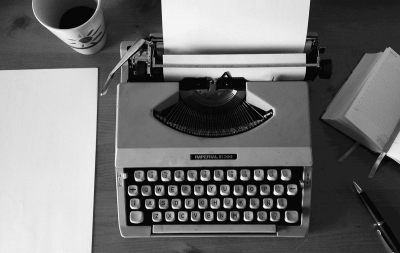 A good story lead is written in the language of your readers and helps you build rapport quickly. It positions you as someone who “gets” them because you’re one of them. Your goal is to build so much trust that when you introduce your product, they’re inclined to accept what you say about it and raise fewer objections. 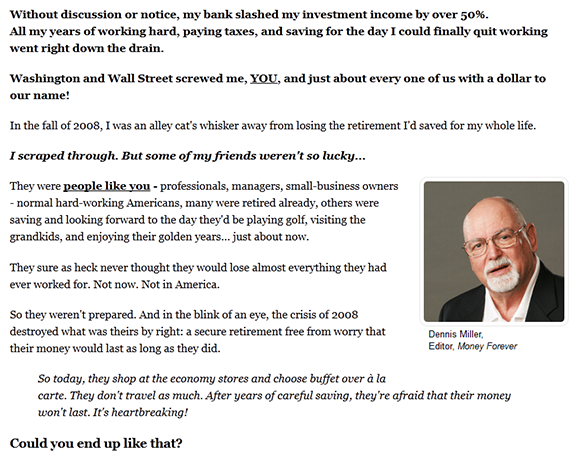 Notice how this lead pulls readers into the story. It’s not just about the writer. It’s about us. Because we’re in this together. That’s one of the keys to a powerful story lead. A couple tips: Keep the story short, and keep it tied at the hip to your core idea. 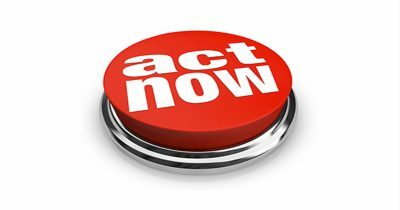 The direct offer lead gets right to business, placing the offer front and center. In many cases, the offer, price, discount, and other bottom-line elements are in the headline and repeated in the lead. Nightingale-Conant’s “Healing Power of ONE” promotion does it well. Usually, direct offers are given to people who already have relationship with you. There’s no need to waste time introducing yourself, so you can get to the point more quickly. Readers may have, for example, already purchased a similar product, so the promotion may only need to present the offer, explain why it’s valuable and overcome objections. The proclamation lead opens with a startling or bold statement intended to get your reader’s attention. Most people think they know what you’re going to say before they see your landing page. If you say something unexpected, you can often jar them out of complacency and make them curious enough to keep reading. To have a doctor denounce cardio certainly gets attention. But in this case, the proclamation is especially good because it resonates with the target audience. To use the proclamation lead, find a startling statistic or breakthrough discovery that people want to know more about. But don’t be shocking for its own sake. Back up your statement with lots of research and proof to keep readers engaged. Sometimes the choice is obvious. You have a powerful statement, a compelling story, or a breakthrough discovery that naturally lends itself to a particular type of lead. But other times the choice isn’t clear. Don’t be afraid to experiment. Try out different types of openings to find the one that fits your promotion best. And remember that you can blend these approaches to come up with your perfect lead. So you might combine the problem/solution and the promise. Or tell a story to tease about a secret. The good news is, once you find the right way to start your promotion, writing the rest of it is easy. 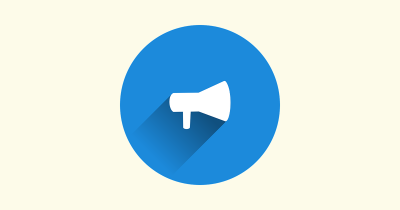 Just present your sales argument in a way that aligns with the type of lead. Add a good headline and offer, and you’re all but guaranteed to get good results. Of course, your landing pages should be part of a strong marketing game plan. But getting your leads right will help you impact that all-important conversion rate.